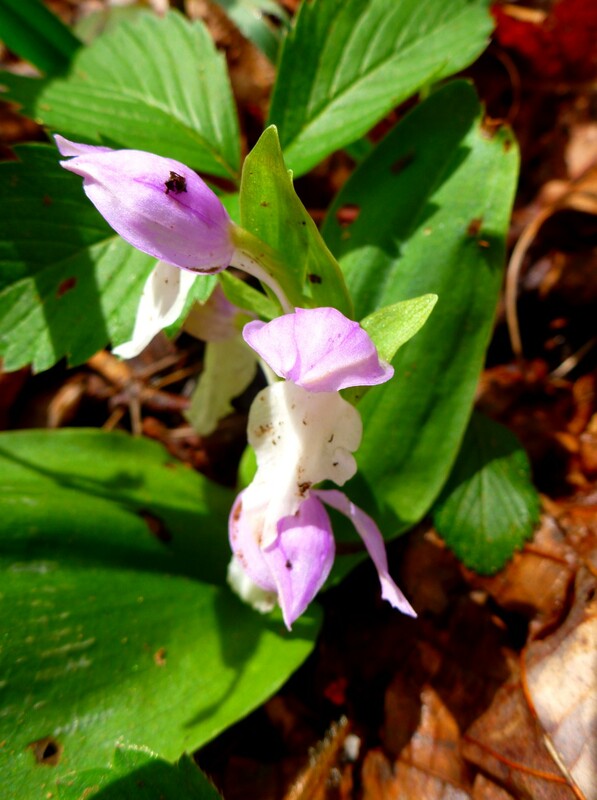 Posted by Jenny in hiking, nature, Southern Appalachians. Fisher Creek, gateway to my favorite part of the Plotts. 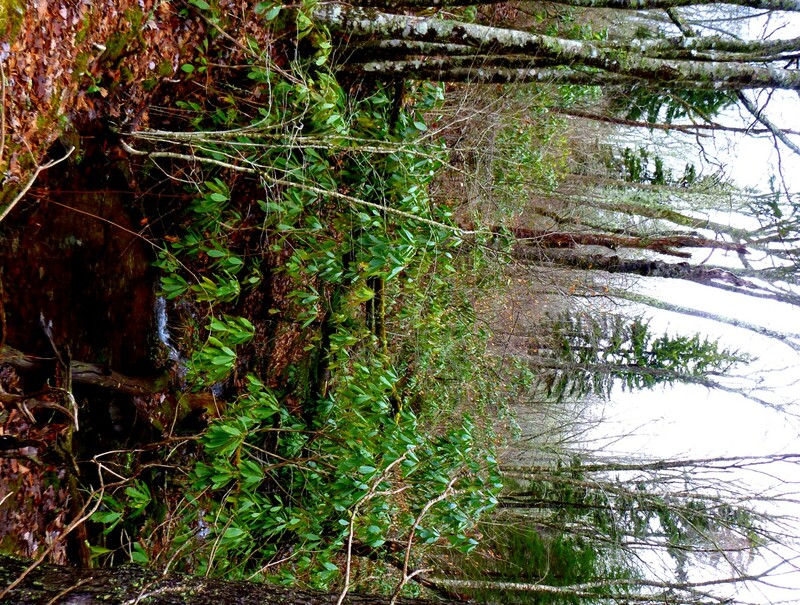 On a showery afternoon, I headed up the East Fork trail. 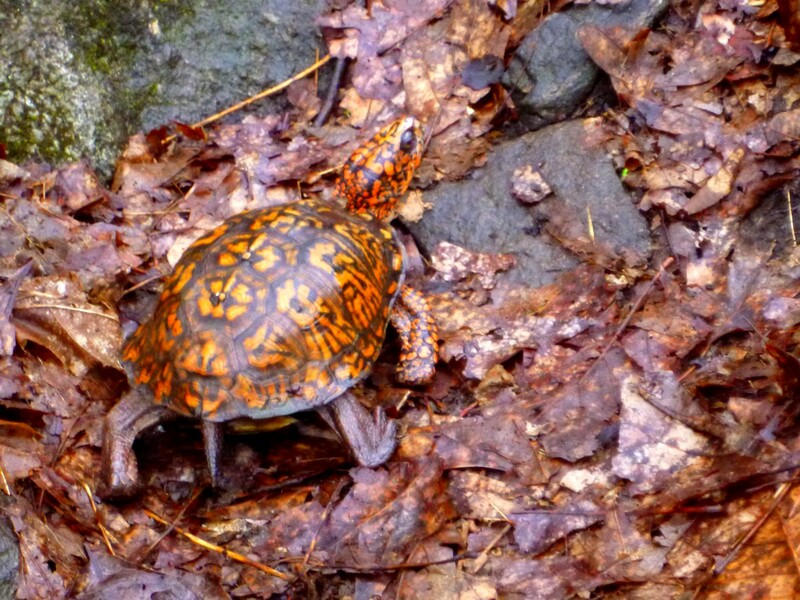 Soon I met a fellow creature who was also heading up the trail. I felt speedy by comparison. What beautiful patterns and colors! As I usually do, I went straight to the top without taking many pictures. It was completely socked in and spitting drizzle at the Fox Hunters Camp, my frequent destination for a good steep 2000′ climb. 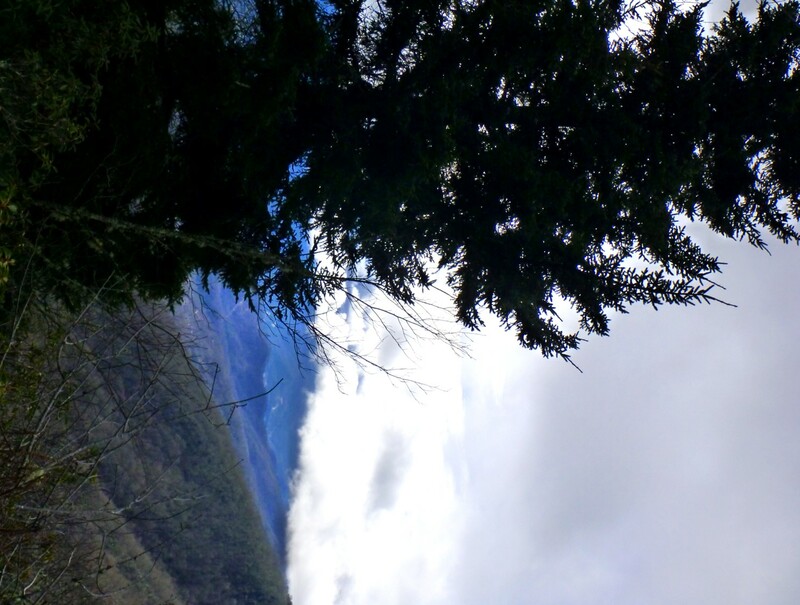 Up in the clouds, I moved through the temperate rainforest. Everything is upholstered in moss. 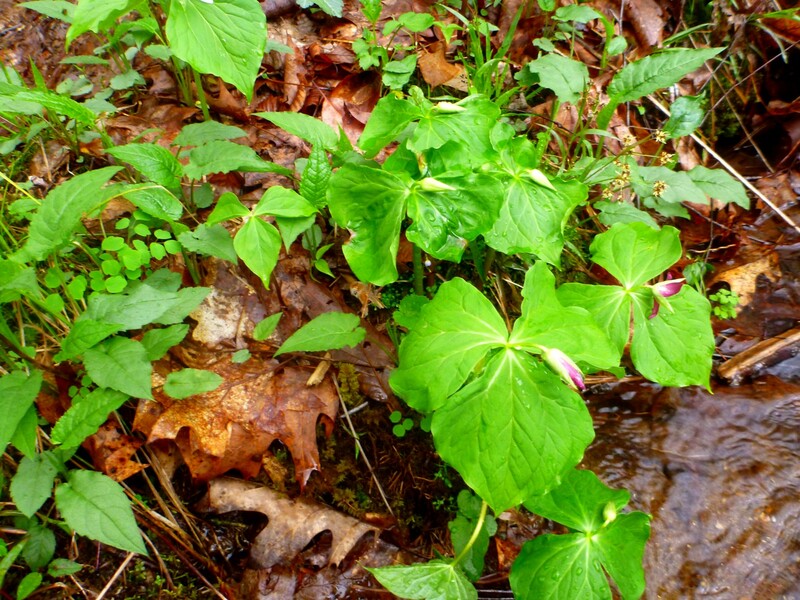 On the way back down, I spotted a cluster of mixed white and red trilliums beside a little streamlet. Just starting to open—in two different colors. 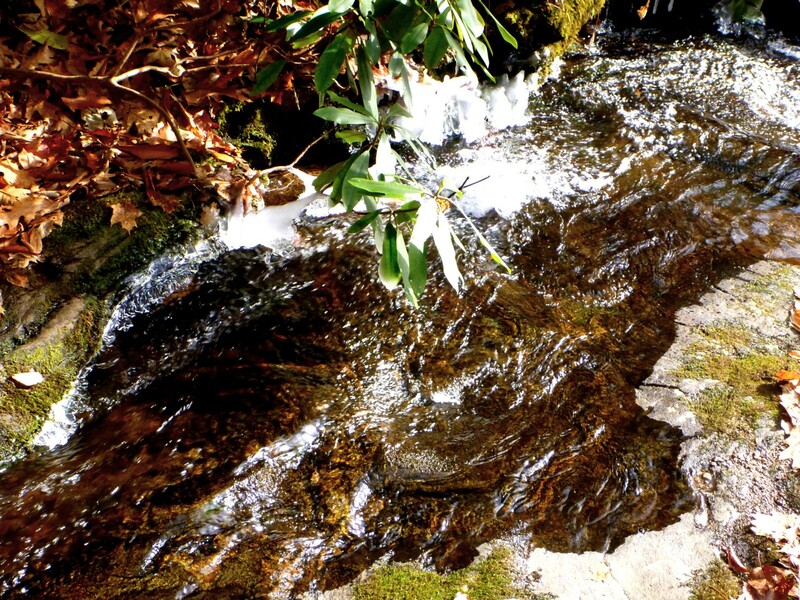 I always notice this small cascade, which runs beside a curved treetrunk. 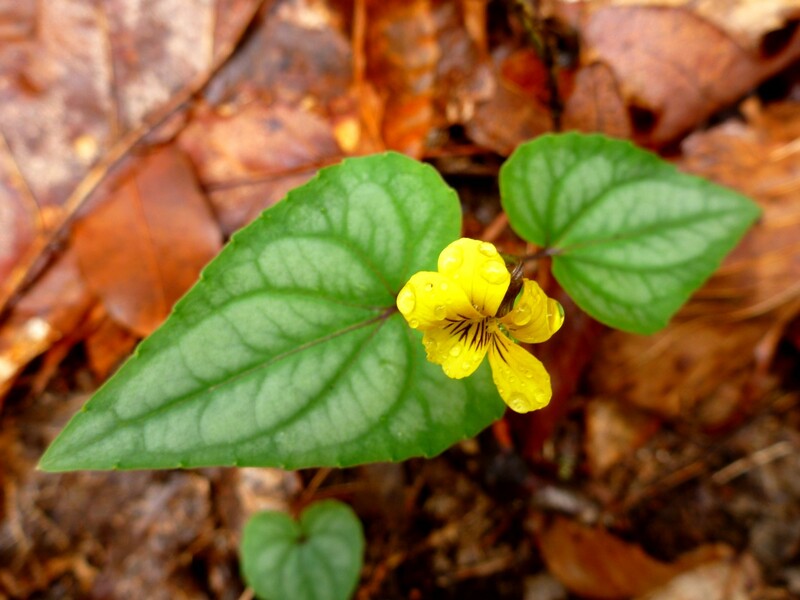 Halberd-leaved yellow violet. 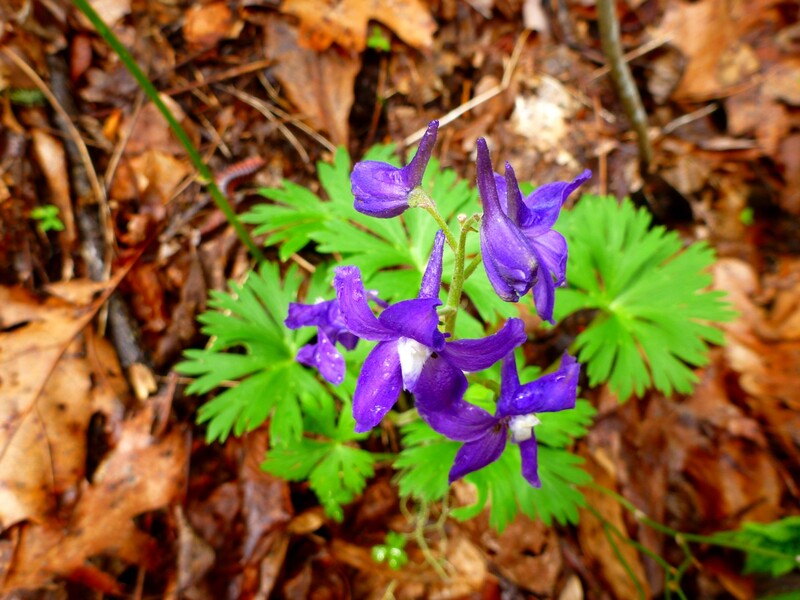 One of the few violets that I can identify. 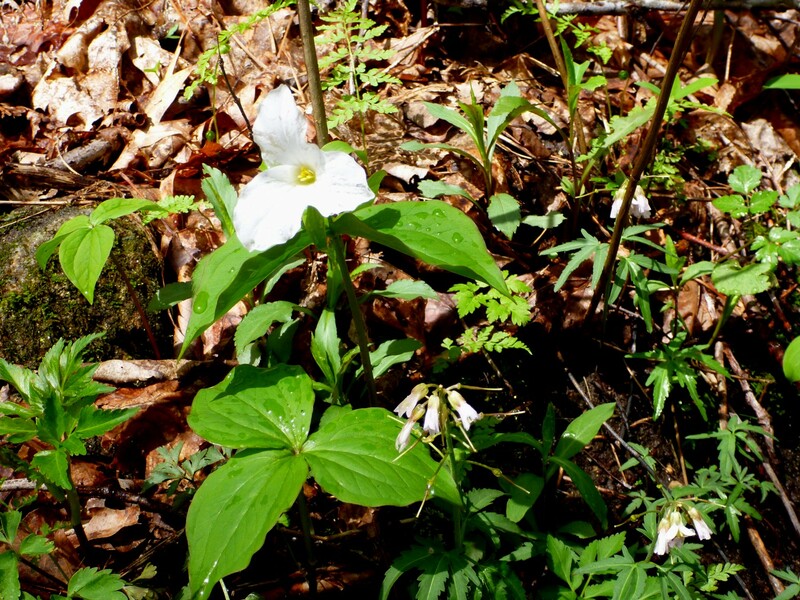 Trillium grandiflorum. 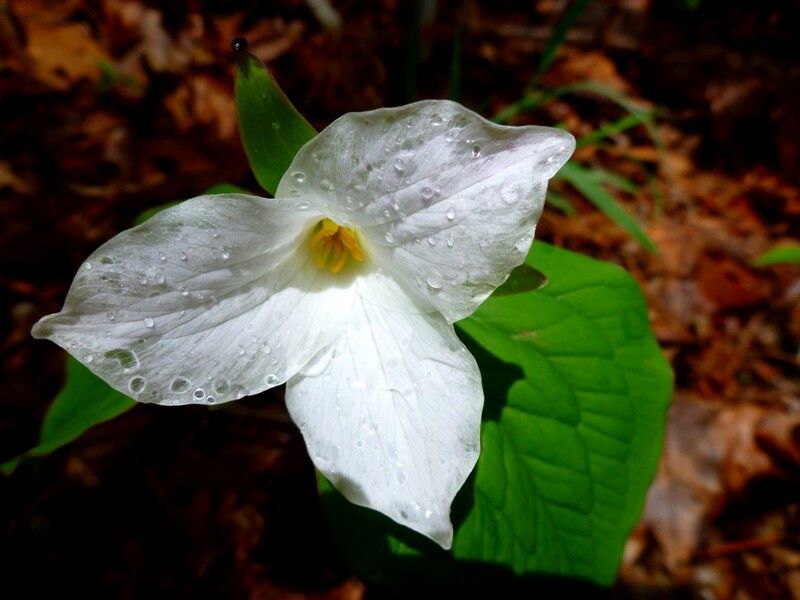 You can also call it Great White Trillium, but somehow I like the Latin better. 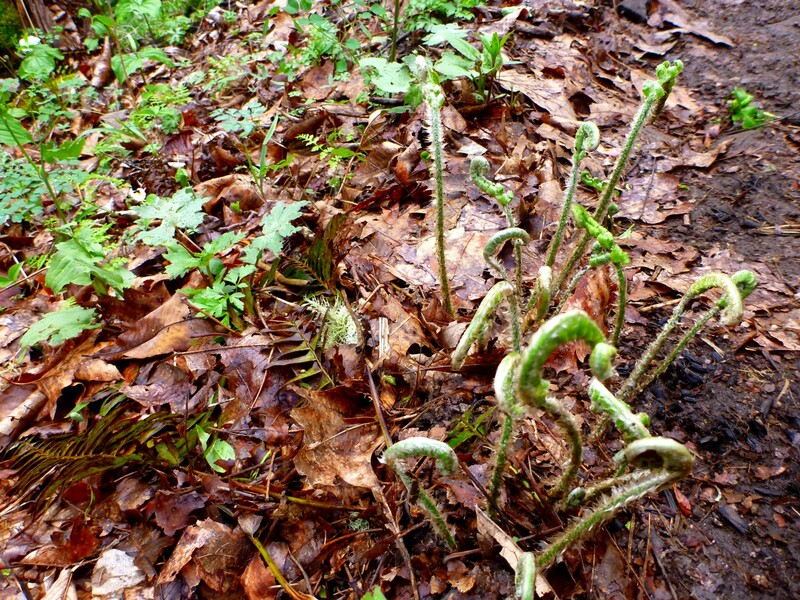 I have a weakness for unfurling ferns. 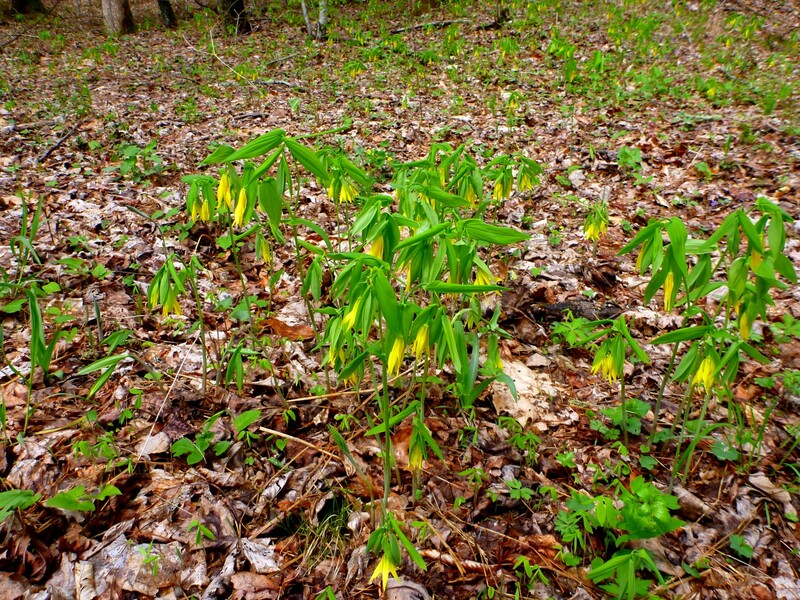 A whole flock of large-flowered bellwort. 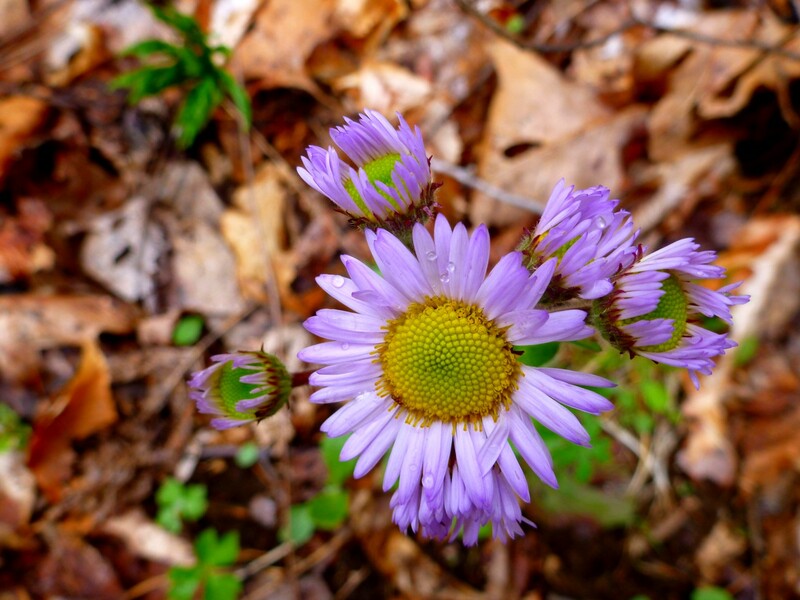 And near the end of my short hike, I saw this splendidly cheerful blossom. 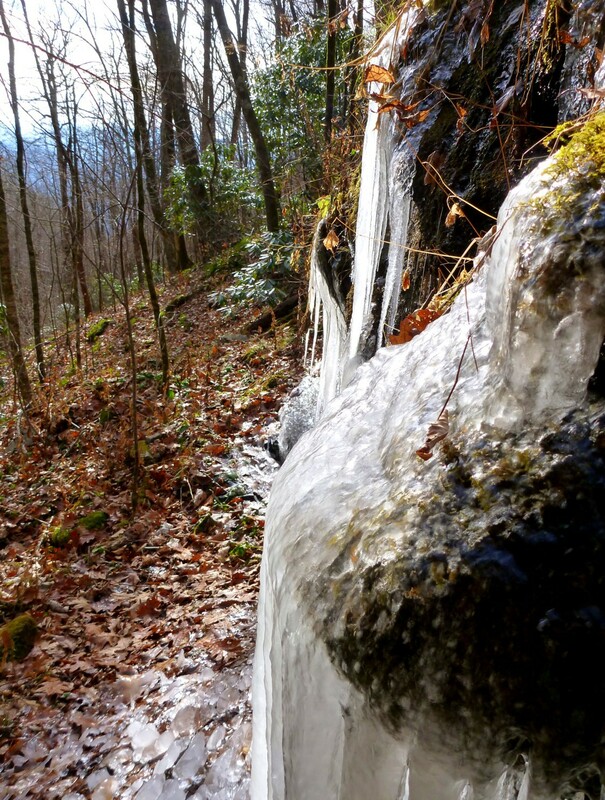 Posted by Jenny in bushwhacking, hiking, photography, Smoky Mountains, Southern Appalachians, weather. 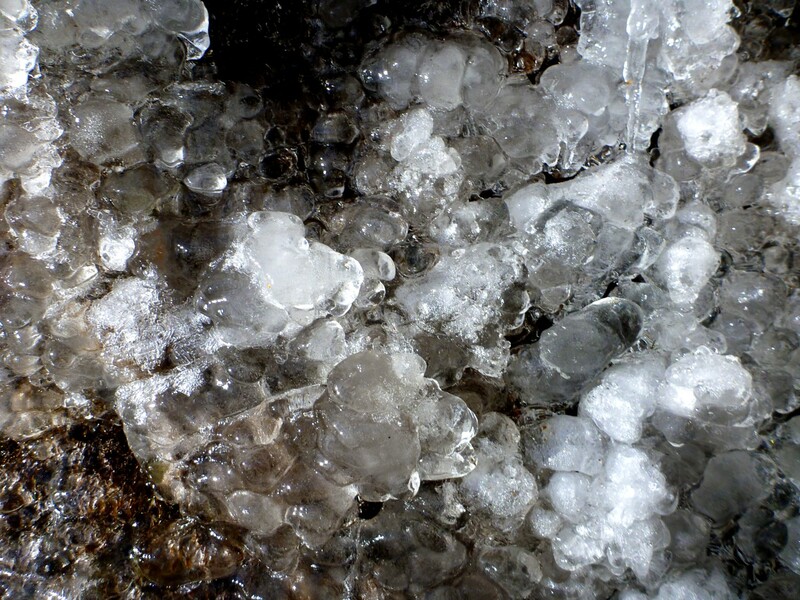 Up close and personal with ice. It’s been a bit cold lately. Approximately 20 degrees colder than normal temperatures for the date. This person didn’t understand the concept of the weather history of a particular spot. Yes, summits are colder than valleys (usually—except when there’s an inversion). The point is that on the date of November 18 each year, there’s an average temp. This year, it is way below average for that summit. 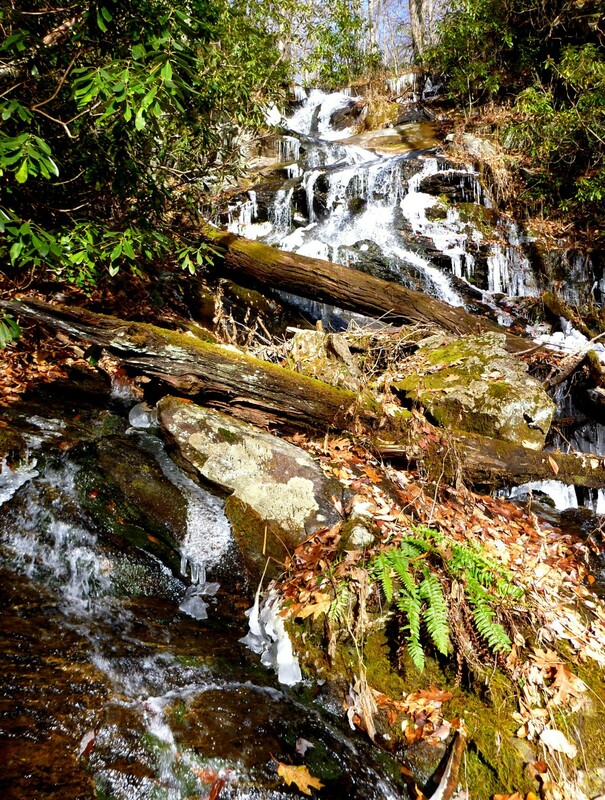 I took a short walk this afternoon to my favorite local destination, an unnamed waterfall on the East Fork of Fisher Creek in the Plott Balsams. You have to bushwhack a short distance to get to a good viewing point at the bottom. I liked the blobs so much, I did a closeup. 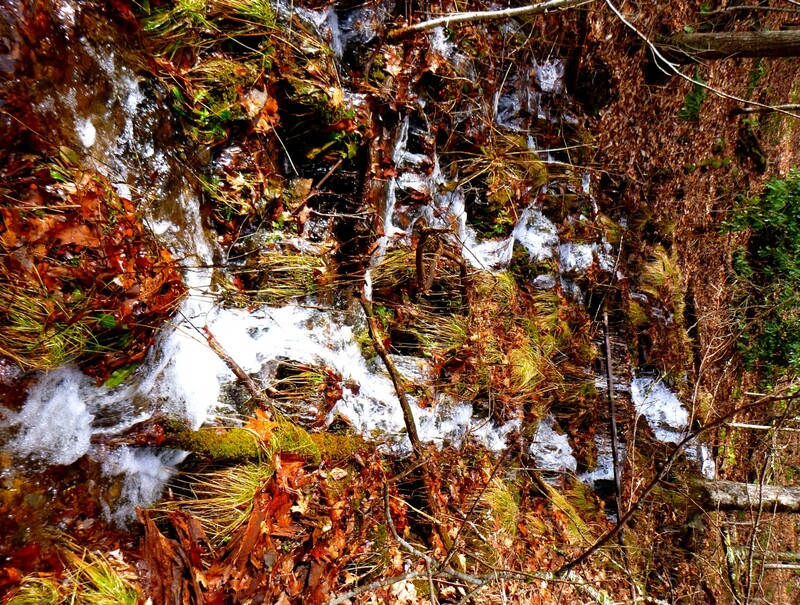 The flow of water is frozen in time. Wait a minute—I mean, it’s actually frozen. 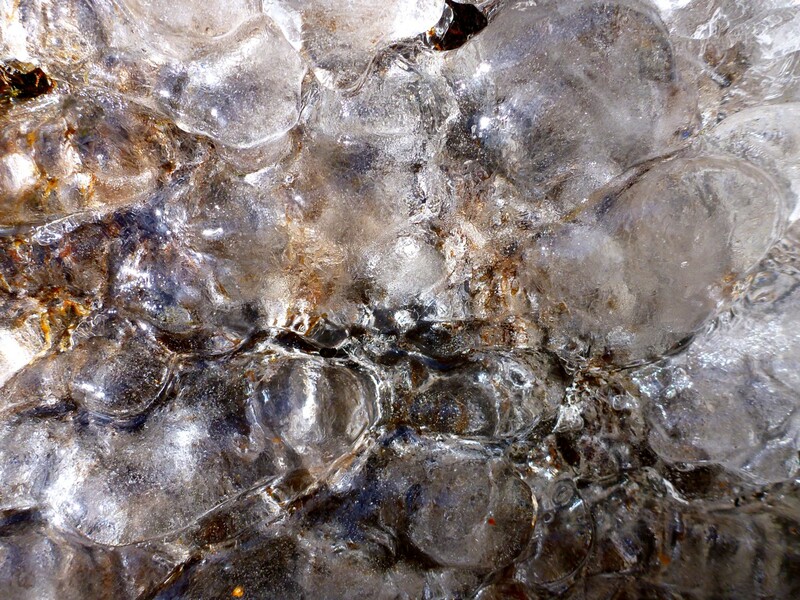 Ice formed on the rhodo over the stream. The upper section of the waterfall. It has two main sections. You can’t take a picture of the whole thing. 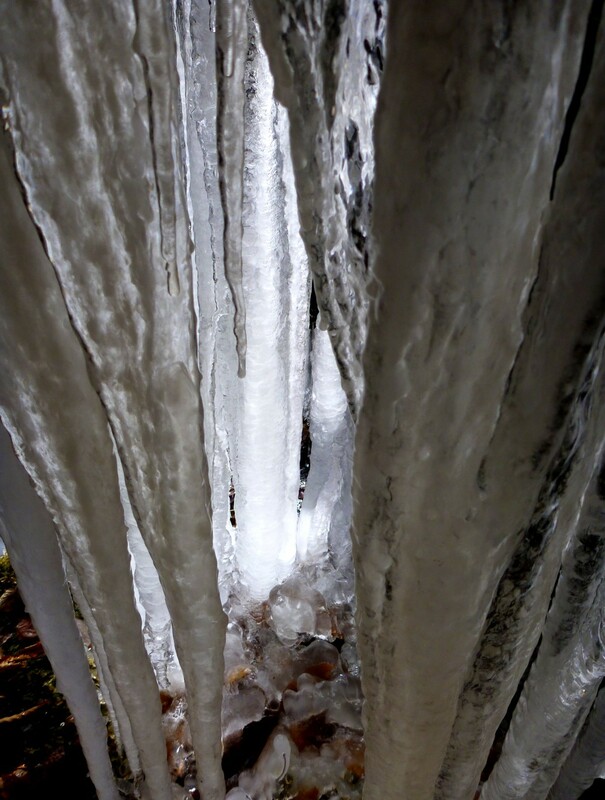 I have been to this waterfall many, many times in all seasons, but I like it best in the hard uncomfortable season of ice. 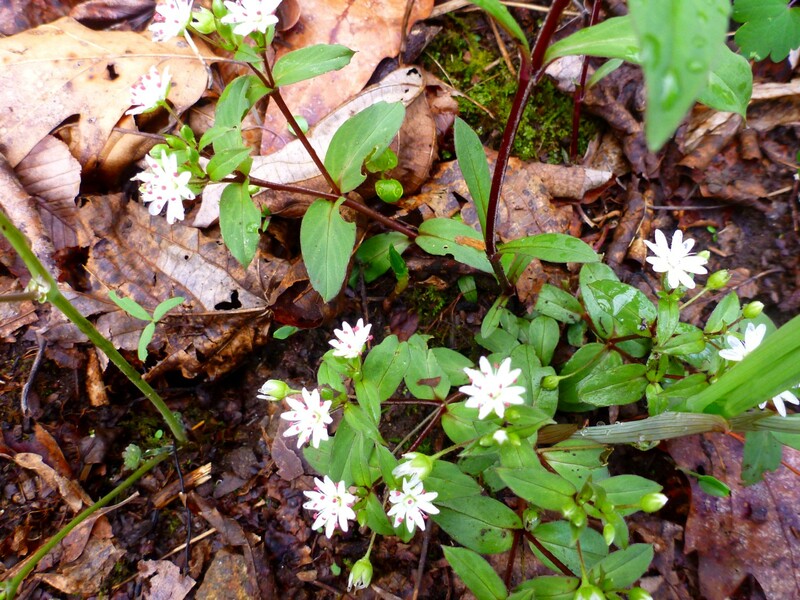 Posted by Jenny in hiking, Life experience, plants, Southern Appalachians. Looking toward Pinnacle Bald from the Fox Hunters Camp. 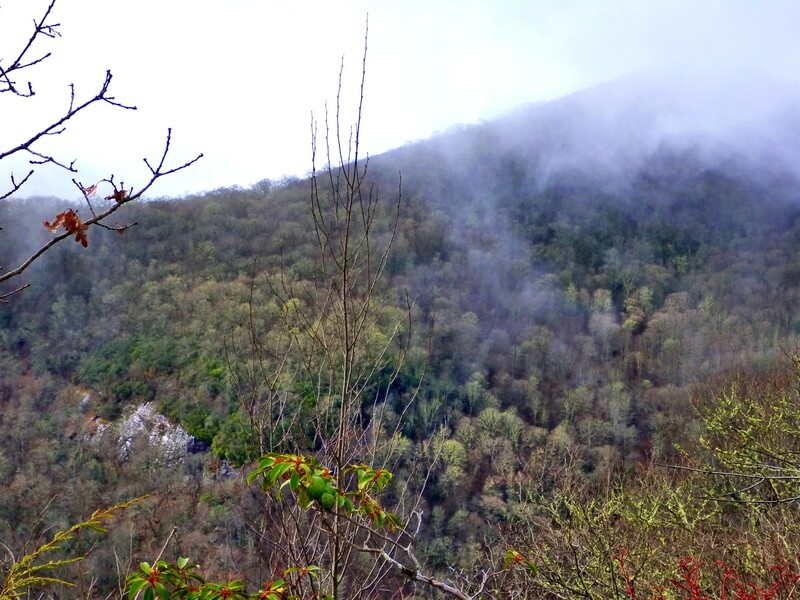 I am so glad to live close to the Plott Balsams, a range that includes several 6000-foot peaks, located just southeast of the Smokies and north of Sylva, North Carolina. 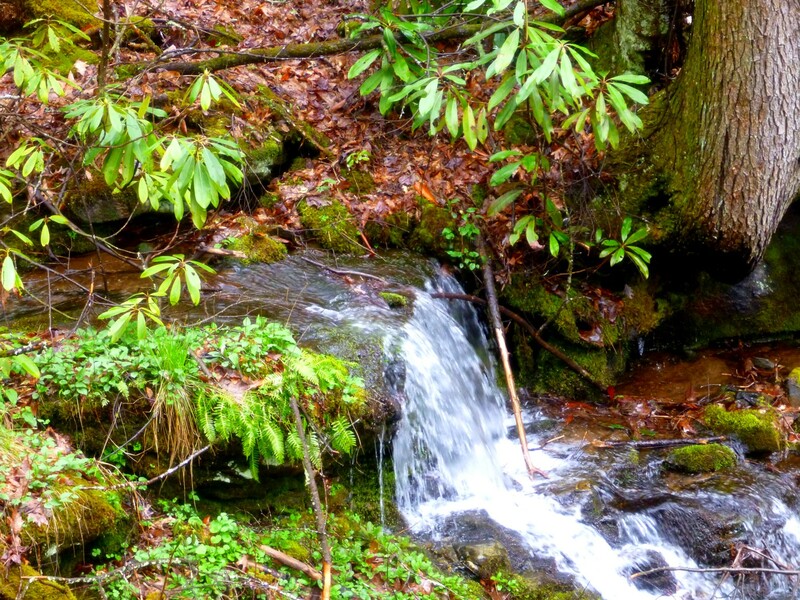 It takes me just fifteen minutes from my house to reach a major trailhead at 3000′ on Fisher Creek. I was going to say I am lucky to have the Plott Balsams so near, but that isn’t quite the right word. That suggests that I ended up here by chance, when actually I am here because I made certain choices in my life. Years ago I opted for self-employment, which gave me the freedom to work from home and therefore the freedom to choose where I live. I paid a price of uneven income and financial uncertainty for a while, but now I am in a more secure situation thanks to good financial advice and good investments. Not everyone would want to live in a town of just 7,000 people that is also the largest town in its county—a pretty unpopulated area. And some probably scratched their heads when a couple of years ago I opted to move away from Asheville, such a fun place to live with so many interesting things to do. It’s just an hour away from here, and it’s nice to know it’s there, but I don’t go there all that often. My life is very quiet. My main activities are writing, reading, and hiking. That would be too quiet for most people! I head up to the Plotts two or three times a week, usually to go up the East Fork trail. It’s good exercise—quite a steep trail—but also I go because there’s something deeply restorative about it. Today I headed out to get in a last hike before I leave town tomorrow to be with my sister in Massachusetts. After yesterday’s heavy rain, the mountains were shrugging the water off their backs. 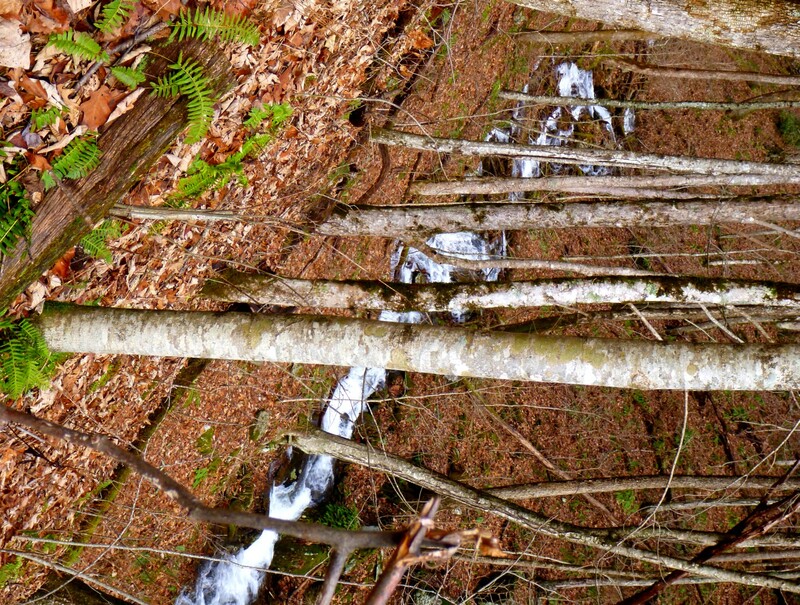 I made the short bushwhack from the trail to get over to the big waterfall. 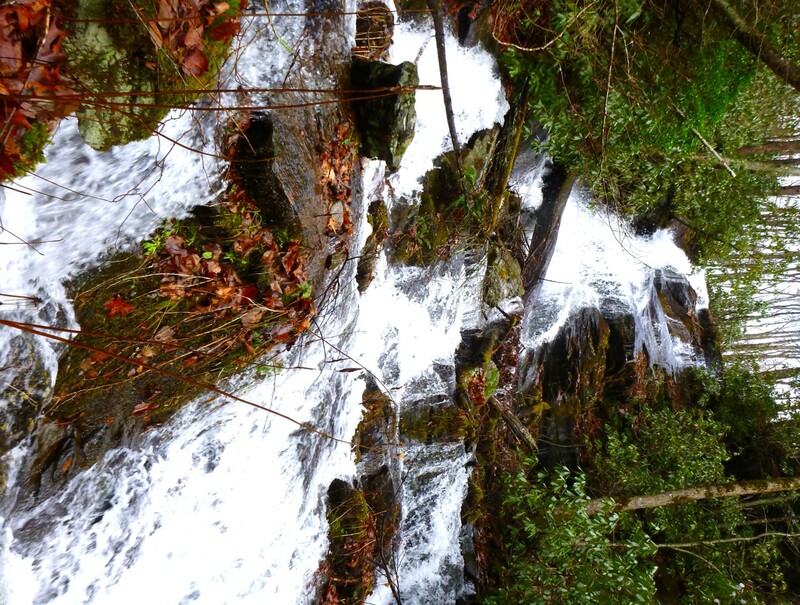 Waterfall on East Fork of Fisher Creek. The falls keep plunging down and down in stages, and you can’t get a picture of the whole thing at once. I hiked up to the Fox Hunters Camp, a flat area at close to 5000′. Last winter the Jackson County rescue squad cleared out some brush there and opened up the view. The rescue squad does trail work each year before the infamous “Assault on Blackrock” trail race in March. Even though the main area of the Fox Hunters Camp is bare, it has an incredible variety of plant and bird life. I saw hummingbirds there several times last summer. A couple of tall spruces grow down at the end. Looking down the West Fork valley toward the Tuckasegee valley. 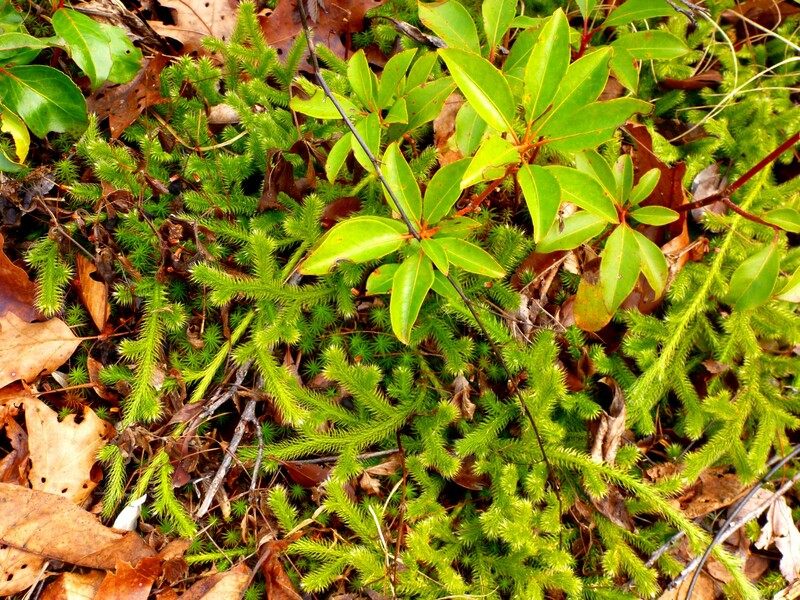 Interesting mosses grow there, including this one that sends out long runners. 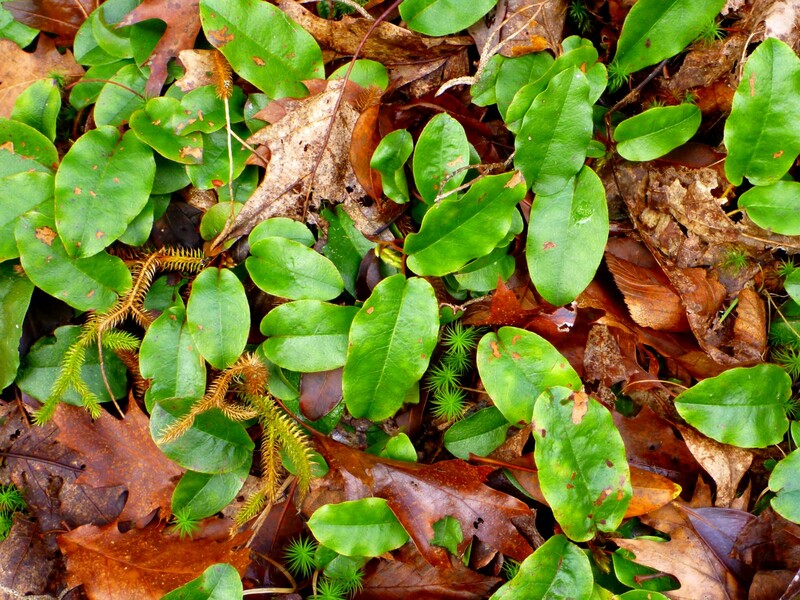 There are carpets of wintergreen. A shrub there is full of buds for next year. 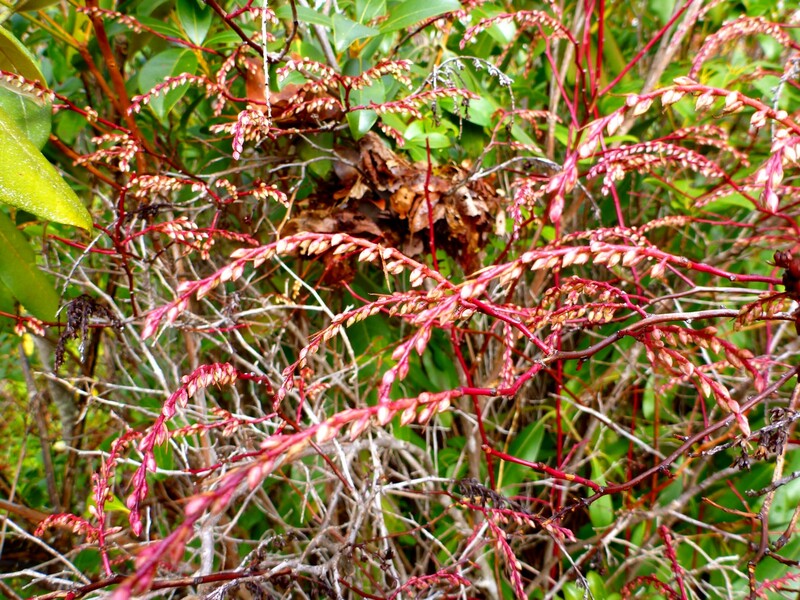 The buds remind me of leucothoe (dog hobble), but it’s a deciduous shrub. All set to bloom next year. There is a grove of red spruce not far below the camp where I like to stop and look at the dark, somber shapes of the trees. Spruce are probably my favorite tree. 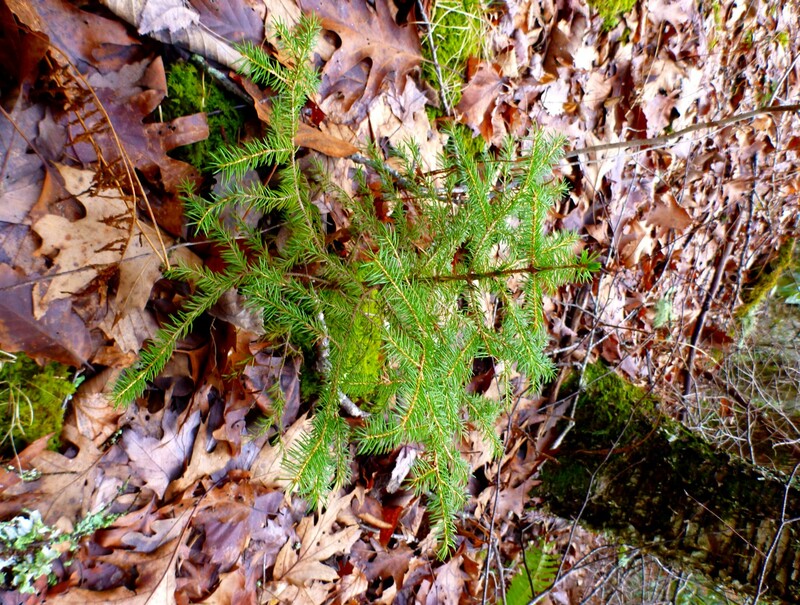 Grow and flourish, baby spruce! 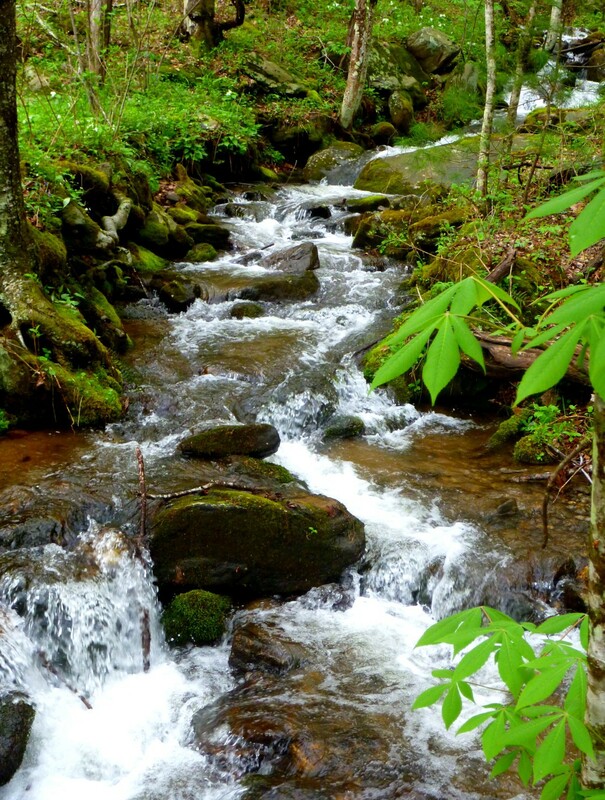 The streams in the Plotts take a different form than in the Smokies. 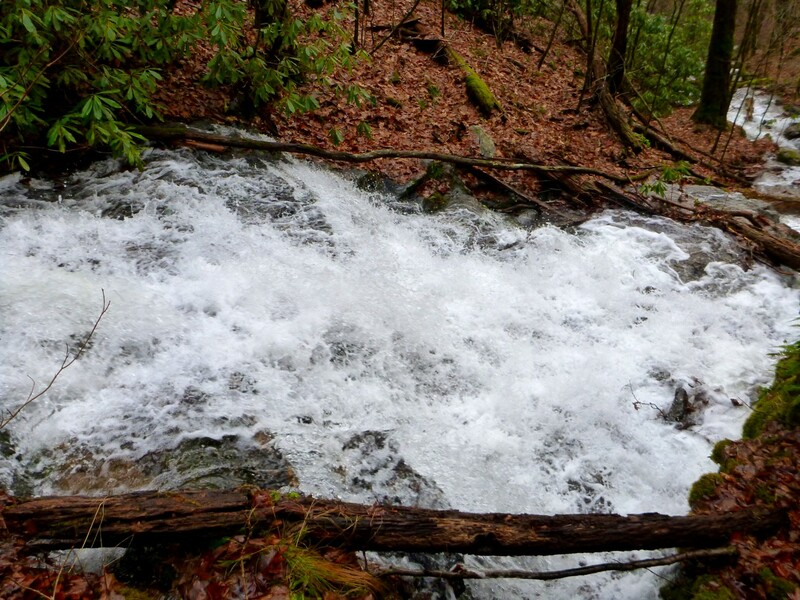 Rather than scouring out U-shaped basins, they flow over the jumbled surface as if they were just temporary flows—even down in the zone of permanent water flow. 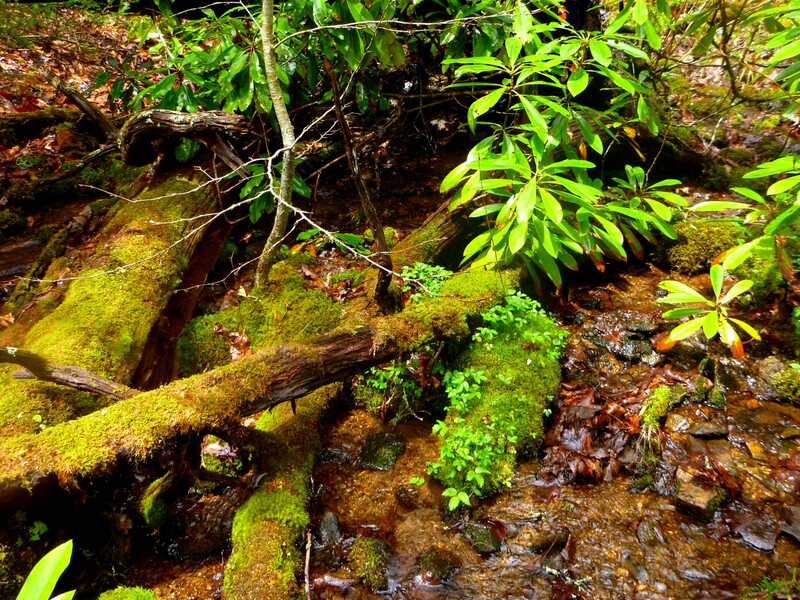 Left fork of the East Fork. Lower East Fork as seen from trail.